The London 2012 Olympics are upon us. Lots of athletes will be judged, timed and measured for the athletic things they do. But aren’t the non-athletic things they do much more interesting? Like tweeting? No, of course not. But that’s not going to stop me from holding my very own Twitter Olympics and handing out (virtual) medals for exceptional Twitter performances. Below is the list of events and the results so far. I’ll be rolling out more results as the real Olympics go on. Who’s most pumped up for the games? In this event, Olympians score one point for every time they have used the words Olympics, Games, or London in their recent tweets. In this event, scores are awarded based on the average number of syllables per word in the Olympian’s tweets. In this event, one point is scored for each Twitter follower. In this event, one point is scored for each Olympian follower. 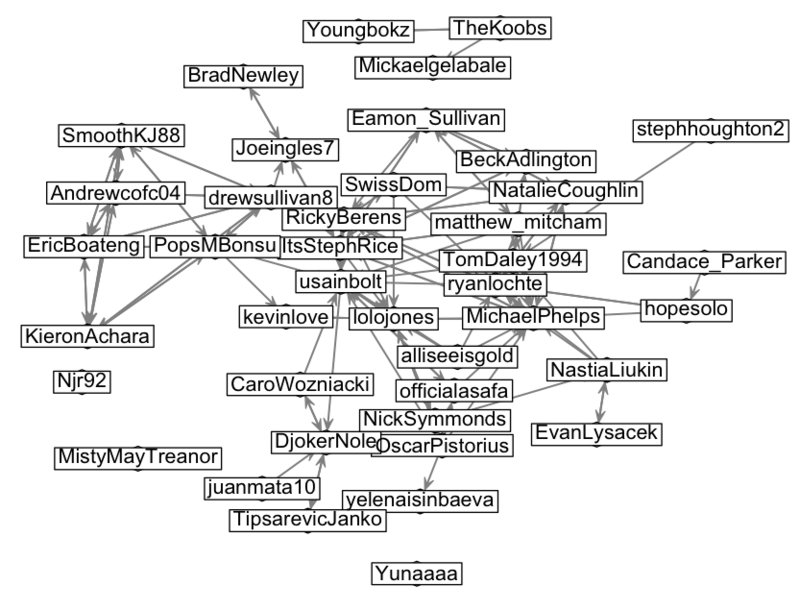 London 2012 Olympians Twitter Follow Network. Arrows point from follower to followee. Click the picture to view a larger version. In this event, one point is scored for each Twitter user the Olympian follows. In this event, one point is scored for each fellow Olympian the Olympian follows. The only event (so far) in which non-Olympians compete. Medals to those non-Olympians who are followed by the most Olympians. Most athletes have many more followERS than followEES. In this event, Olympians are scored according the proportion of their followers that they follow back. You can tweet me @jasonjones_jjj. I especially welcome tweets with more London 2012 athlete Twitter handles and suggestions for new events. Check out the Twitter Olympics practice run in my last blog post. In that version I used Twitter’s list of “verified” Olympians – consisting mostly of Winter Games athletes. This entry was posted in social networks and tagged olympics, social networks, sports, technology, twitter on July 26, 2012 by shotgunapproach.